Are Umps Playing Through Pain for MLB-Wilson's Sake? Is MLB and Wilson's sponsorship deal hurting umpires or is the association a positive presence for umpire safety? Concussions and other umpire injuries have apparently "skyrocketed" in recent years, according to a topic of debate presented at the 2014 National Sports Law Negotiation Competition (Behind the Mask). The pointed accusations argued at the annual moot contest included declining steel quality, MLB-Wilson's exclusivity contract and a reference to the umpiring community's thus-far lone litigator, Ed Hickox. The Behind the Mask round of debate presented by NSLNC host Thomas Jefferson School of Law's Center for Sports Law & Policy pitted teams from law schools around the country in arguing the MLB-Wilson equipment situation on behalf of both key stakeholders—the World Umpires Union (sic, "World Umpires Association," herein WUA, is the correct title) and Wilson Equipment (Amer Sports Corporation's Wilson Sporting Goods Company). Accordingly, the following article is presented in the National Sports Law Negotiation Competition spirit with a focus "on current issues in sports each year and facilitates students, coaches, and judges to negotiate and make decisions on these sports topics in an academic setting." The NSLNC's mission is "to provide the sports profession with a body of able and ready legal minds, through the negotiation and training of law students with the use of real-life issues affecting athletes, sports franchises, teams, businesses, and entities." Presented as an objective analysis and overview of the issue, the UEFL does not draft nor endorse any opinion for or against any stance in the NSLNC WUA v Wilson debate. According to its website, the NSLNC boasts former Minor League Baseball umpire Brandon Leopoldus (2000-2004, serving as California League All-Star Game Crew Chief in 2004 having worked the 2003 Cal League Championship Series) as a Board member. Leopoldus has previously written for Referee Magazine as a legal consultant regarding liability, camps, and taxes/FEINs. ≫ 1996: Wilson debuts its single bar lightweight steel umpire mask, which soon becomes known as industry best. ≫ 2002: Wilson changes its steel supplier for mask bars due to the declining US steel industry. The new supplier effectively provides "much cheaper steel," accordingly of a "far lower quality." ≫ 2009: Wilson and MLB sign a contract stating that Wilson shall be the exclusive protective equipment supplier to umpires working MLB games. Wilson's is the only logo that umpires may display on their protective equipment (N/A to shoes). ≫ Fall 2013: Wilson again changes its steel supplier, further diminishing steel quality. Wilson develops a new titanium frame, but the NSLNC doc notes this "has only seen an even greater uptick in concussions." The NSLNC noted that of the time of the 2009 sponsorship deal, more than 90% of all professional umpires wore at least one Wilson product (e.g., the licensed West Vest). In 2012, an Umpire-Empire post indicated that 50 big league umpires (of 85) wore a Wilson model while 55 wore a Wilson chest protector, such as the West Vest (including 55 West Vests [5 Original Douglas models included in the tally]). NSLNC also wrote that Wilson's internal testing records showed several concussions associated with the company's facemask products, a finding that purportedly was leaked to the media and to the WUA. The findings indicate that since then, MLB has allotted WUA some lee-way in negotiating their own new mask deal, including an opt-out clause in the MLB-WUA CBA related protective equipment that may be invoked when umpires are injured during MLB games while using official equipment. According to NSLNC, over 20 WUA members have suffered diagnosed concussions while wearing the newest Wilson masks, which had turned the WUA sour on MLB's exclusive relationship with Wilson. Per NSLNC: "It is in Wilson’s best interest to keep umpires safe, and it is in the WUA’s interest in ensuring that its members are receiving access to the best possible equipment available, regardless of who makes it. The WUA is also interested in obtaining fair compensation for its members for, in effect, endorsing Wilson products." This might place some stakeholders, such as umpire Joe West, in a unique position. West's MLB Umpire Profile states that he designed "all of Wilson Sporting Goods' 'high-end' umpire equipment," and West indeed designed and patented the popular West Vest chest protector, subsequently founding a company called West Vest, LLC. West additionally serves as President of the World Umpires Association. In December 2014, contract negotiations between MLB and WUA stalled, and although umpire lockout remained a possibility, the umpires and baseball reached agreement on a five-year contract about 10 days later. A since-removed online video promoting his flagship product famously showed West taking a fastball directly to the West Vest chest protector and appearing not to be bothered by its impact whatsoever. Yet the crux of the umpire safety issue these days is the mask, not the chest protector, which makes or breaks the issue of head trauma in a way a chest protector does not. A quick review of the most recent 2015 season umpire facial, neck, and head injuries show some umpires removed from gameplay under concussion protocol or head injury concerns have worn certain Wilson masks (such as Tom Hallion on 7/1/15 or Marty Foster on 6/16/15, etc.) while others such as Greg Gibson, for instance, who took a direct shot to the face and remained in the game and series, wore non-Wilson products: Gibon's HSM resembles an All-Star System 7 helmet and is completely devoid of any manufacturer's logo (remember, if it's not a Wilson, its logo cannot be displayed pursuant to the terms of MLB's exclusivity relationship with Wilson). But remember sampling bias as a majority of MLB umpires do wear Wilson products (which are, of course, visible thanks to the trademark "W") and non-Wilson headwear umpires have also experienced game-ending cranial injury (CB Bucknor, 7/13/13, though he remained in a 2012 game after a deflection to the face). In a similar vein, Wilson-wearer Clint Fagan stayed in his game after taking a deflection to the face. All else equal (assuming all masks are of the same quality, safety, etc. ), a majority of concussions would be expected to occur in the Wilson-wearing population. Ed Hickox has long been the high profile umpire and WUA member to have gone after Wilson in court (in two separate cases; the first concerning a 2005 injury and the latter a 2009 injury, both while wearing Wilson products behind the plate). Dr. Paul did not merely assert that the angle of the throat guard was a defect that caused Mr. Hickox's injuries; rather, Dr. Paul explained his reasoning, step by step. Using freeze frames of the video of the incident, Dr. Paul stated his opinion that the angle of the throat guard caused the mask to trap the ball before deflecting it, concentrating the energy of the ball at the point of impact. Dr. Paul further explained how the impact of the ball hitting the throat guard created a wedging action that pushed the wire portion of the mask against Mr. Hickox's jaw bone, causing injury. The throat guard allegedly was angled forward instead of extending straight down and lacked a center wire that could have deflected the ball instead of temporarily trapping it. That specific trial, which was argued in front of a jury, ended in award to the Hickoxes: The jury rendered verdict for the plaintiffs on each of their claims, which included strict liability for a defective product, design defect, negligent design, design defect due to failure to warn, and breach of implied warranty of fitness for a particular purpose. Ed was awarded $750,000 and wife Lisa was awarded $25,000 in damages (he originally sought $2 million, and Lisa sought $200,000). Think Manny Gonzalez's own game-ending foul ball to the throat under a Wilson mask in New York brought back some painful memories? Wilson had tried to argue Paul's testimony was faulty and lacked scientific foundation, that the jury should have been instructed on an assumption-of-risk defense, and insufficient evidence to support judgment against it on product-liability claims. At the end of it all, however, a DC appeals court affirmed the trial court (and jury)'s decision resulting in a $775k award to the plaintiffs. Hickox himself is no stranger to the law, serving as a Daytona Beach Shores Police Department detective during the MLB offseason. Attorney Patrick Regan noted, "They were using the umpires and catchers as human guinea pigs" in response to Wilson's presentation of their practice of "field testing," wherein Wilson observed how the mask held up while being worn by umpires and catchers during live ball action. In 2012—while waiting for Wilson's appeal of the 2005 injury case to be heard—Hickox filed in New York State Supreme Court over a 2009 injury sustained while wearing the A5590 Titanium Shock FX Helmet—that's a 2005 injury due to a defective traditional-style facemask (throat guard angle) that cost Wilson $775,000 and a 2009 lawsuit against Wilson that now alleged the company was extremely negligent by showing a "willful and wanton disregard" if not outright malice or a complete disregard for umpire safety with a titanium hockey-style mask. The 2009 foul ball injury purportedly resulted from the A5590 mask fracturing into several pieces, while Hickox suffered a concussion, injuries to his left year, as well as a closed head injury, including "permanent injuries as a result of the incident in question without any contributory fault of his own." Lisa Hickox additionally claimed loss of society, companionship and consortium. The NSLNC report states that this second lawsuit was adjudicated and that "settlements were sealed by order of the court." So is MLB's association with Wilson hurting or helping umpires? Hickox proved—in multiple courts of law—that in two specific cases of injury, Wilson was liable and negligent in part over a faulty mask design and, in the DC case, responsible for offering Hickox a mask that hadn't been adequately tested and, in Reagan's language, using him during field testing as a "human guinea pig," but this sample size is, of course, extremely small, statistically unreliable, and refers to incidents taking place a decade (and six years) ago. The NSLNC paper presented several facts that could be used by competition teams to make the argument that Wilson exclusivity may in some cases endanger umpire safety, while leaving the door open for rebuttal in favor of keeping Wilson in the loop—and clearly invested with umpires—through its association with equipment developers and patent-holders, such as Joe West of the West Vest. As relates to masks, West designed several masks for Wilson, noting that (according to his website), "the masks that were designed for Wilson by Joe West evolved into two single (as opposed to hinged) cross bars." Notably, the West Vest umpire masks featured on Umpirejoewest.com appear to feature throat frames which extend at a close to vertical angle, unlike the mask Hickox wore when he suffered his 2005 injury. 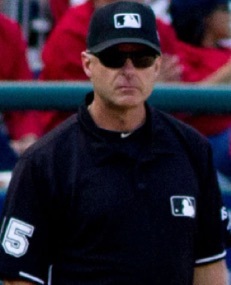 West is clearly in a unique position as both an equipment designer and third-term President of the World Umpires Association. For what it's worth, an equally slim sample of Amazon users rated the traditional-style Diamond Sports mask ahead of the comparable Wilson Dyna-Lite model, but Wilson's Shock FX 2.0 beat out all others in the hockey-style mask category—the sampling, however, was likely of amateur officials and certainly not scientific in nature. At present, the science is inconclusive when it comes to the traditional vs. hockey-style mask debate, but even here, no specific manufacturer was rated higher than another. The National Operating Committee on Standards for Athletic Equipment endorses the HSM over the traditional mask ("For impacts to the face, the hockey-style mask is significantly superior to the traditional catcher’s headgear combination...For umpires to be the safest, they should buy a black catcher’s hockey-style mask because it will have been certified by NOCSAE").